Exactly What Kind Of Socialist Is Bernie Sanders? : It's All Politics Socialists are a rare breed of political animal in this country. There's just one in Congress — Vermont senator and presidential candidate Bernie Sanders. 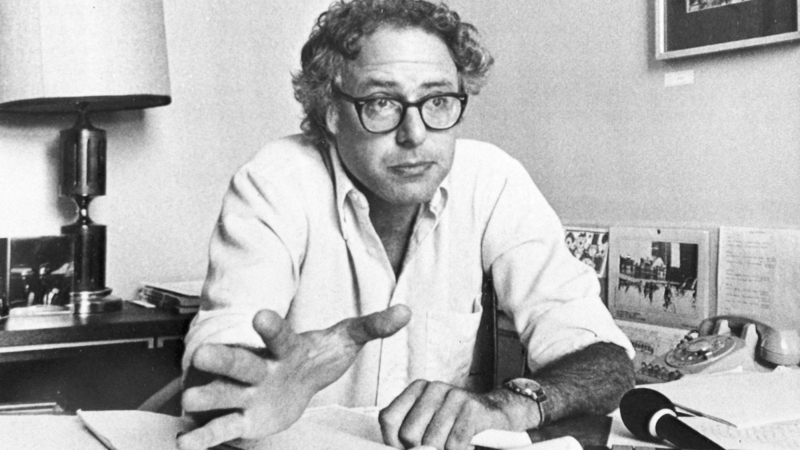 Sen. Bernie Sanders in his office in 1981, shortly after becoming mayor of Burlington, Vt. He once said his tenure as a socialist mayor is evidence people are willing to accept radical change. More Americans say they would vote for a Muslim or an atheist for president than they would for a socialist, according to a recent Gallup Poll. Yet "socialist" is now how Vermont Sen. Bernie Sanders has described himself throughout his career. Sanders has not run from the term, even as he surges in his race for president. His socialist tag line first reached a national audience in the 1980s when Sanders became mayor of Burlington. "They laughed at Bernie Sanders when he ran for mayor, not just because he was a brash outsider from Brooklyn, neither Republican nor Democrat, but because he was an avowed socialist," said an NBC News report in 1985, the day Sanders was sworn in for his third term as Burlington mayor. More recently, Missouri Sen. Claire McCaskill — widely seen as a proxy for Sanders rival Hillary Clinton — used the S-word, questioning whether the media have done enough to expose Sanders' true political leanings. "I think the media is giving Bernie a pass right now. I very rarely read in any coverage of Bernie that he is a socialist," McCaskill said. "I think he would like to see Medicare for all." Sanders waits to speak at a town hall meeting last December in Ames, Iowa. Sanders is a socialist, but it's not a word he often uses on the campaign trail to define himself. Guilty as charged, says Sanders. When pressed, he calls himself a Democratic socialist. And he does support universal health care through a single payer system like Medicare for all. And the news media ignoring Sanders' socialist label? The description is in pretty much every profile of Sanders. But it is not a word Sanders often uses on the campaign trail to define himself. Here's how Sanders reacted when VPR's Bob Kinzel asked him recently about that "avowed socialist" tagline. "You have known me for a few years. Do I go around saying, 'Hey Bob, I am the self-avowed socialist?' 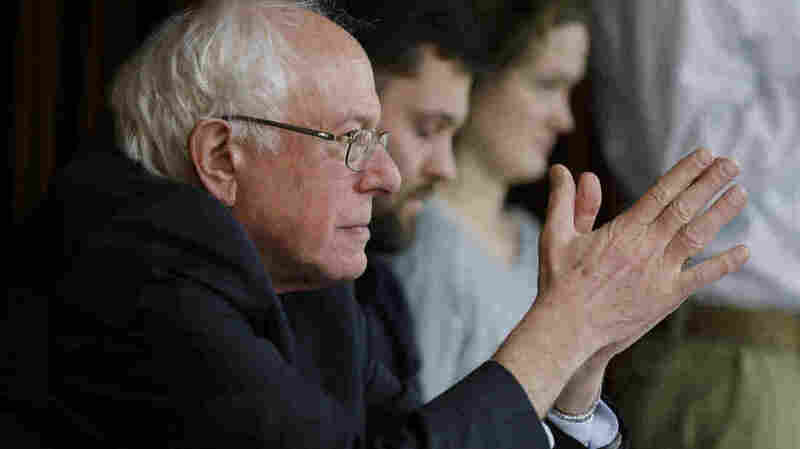 You know, it's what media does," Sanders said. Webster's dictionary defines socialism as a form of society in which government owns or controls major industries. Marxist theory says socialism is the transitional stage between capitalism and communism. Neither one of these definitions is what Sanders is talking about. "What am I trying to do in this campaign is to tell Americans what many of them don't know: that the benefits for working people are a lot, lot stronger in many other countries around the world," he has said. Sanders points out that in many races for mayor and Congress he ran and won as an independent, not as a member of any socialist party. And he says the kind of socialism he advocates is the Democratic socialism seen in Scandinavia and other countries in Europe. Those governments support paid sick leave, universal health care and free higher education. "How many Americans know that in virtually every major industrialized country people are guaranteed vacation time, paid vacation time? That when you have a baby, moms and dads are guaranteed ... family leave?" he said. Garrison Nelson, a professor of political science at the University of Vermont, has observed Sanders throughout his political career. "This is not communism; this is not five-year plans, collectivized agriculture and nationalized industry," he said. Back in 1981 when Sanders was first elected mayor of Burlington, Nelson said reporters from Europe called him because what they viewed as normal in politics was considered an aberration in the States. "It's a relatively mild, I would say a vanilla socialism," Nelson said Sanders told them. "It's basically focused on big businesses, and capitalist inequalities." Eric Davis, a retired Middlebury College political scientist, agrees. "In Western Europe, these are mainstream political parties that are in and out of government all the time," he said. Of course, Sanders is not running for president of Sweden. And for many U.S. voters, socialist sounds a lot like communist. And that Gallup Poll showing more Americans would vote for an atheist or Muslim than a socialist? Sanders told the New York Times recently that he thought the numbers were surprisingly good since they showed 47 percent of the electorate would vote for a socialist. He also said that percentage will increase as his campaign continues.